Nurse Angry is, thankfully, ANGRY again. The vehicle pictured below gave her a timely reminder of why she started writing a blog at all. The original idea was to document all the ways her sleep has been blocked, stunted, mashed, chopped up and otherwise mutilated in the last 2 years, turning her from a relatively well-balanced human being to an angry, antisocial monster. Everything from the stupid garbage truck to noisy neighbors and their bad taste in music to stress from having to get up for work earlier than what is decent to the kids to a whole lot of other stuff you just WOULDN’T BELIEVE. Time for a good rant. 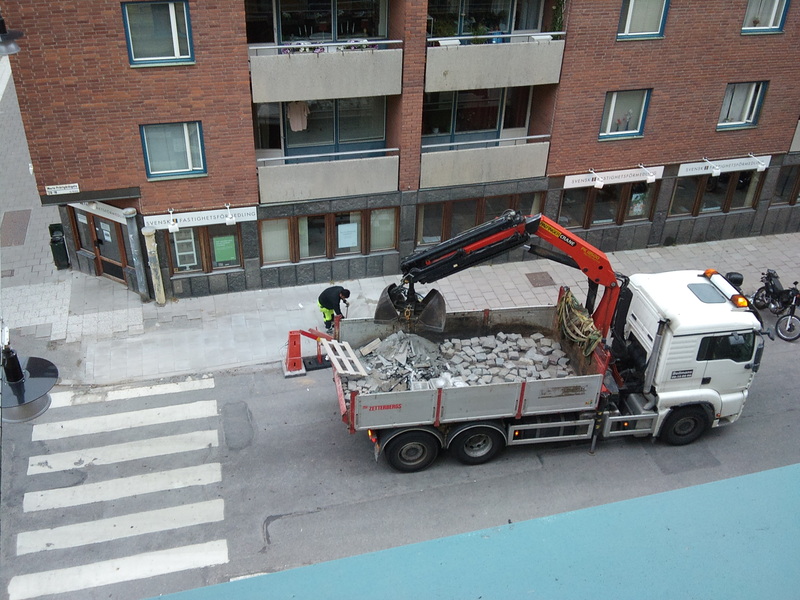 It is 7:25 AM on Södermalm in Stockholm and the worker pictured outside Nurse Angry’s bedroom window (ok, technically it’s not her bedroom, but she borrowed it again) has just FINISHED what he was doing. This is a long-term construction project which has been highly active for at least a month. Not sure what the underlying work was, but the simple re-doing of the sidewalk has taken the better part of a week and APPEARED to be finished yesterday morning after a small group of guys finished CUTTING THE PAVING STONES at 6:30.What’s the deal with that, by the way? One guy does all the work and 4 others stand and watch. Don’t they have any more tools? Is this our Swedish tax kronor at work? For the first half an hour today from 6:30 to 7 it was unclear what the scritchety crashing noises were about because Nurse Angry was still ATTEMPTING to sleep. She did, however recognize the whirring sound that tells you that either a large vehicle is TURNED ON outside or a space ship has landed on your street. When she actually got up to see, Mr. Construction Worker was shoveling gravel and grit into the scooper and moving it into the truck. Scratch, scratch, scratch, bang of the shovel on the scoop, then move the 10 shovelfuls into the truck with help of the remote. And on to the next square foot. After that, he threw a lot of broken stones in the loading bed from one place to another to make room to lower in a bundle of paving stones. By 7:30 he was on his merry way. And guess what? At 7:30 the garbage truck arrived! It never comes at the same time as other random crashing noises outside. But more about the sanitation symphony in Stockholm another day. The only good thing about being woken up early is that NA gets to have a cup of tea and a piece of toast with peanut butter. You can take the crazy woman out of America, but you can’t take her peanut butter!